No longer just a sports shoe, the white sneaker has made it into the fashion mainstream. THE humble white sneaker has bounced out of the gym and onto the street, but most noticeably into our workwear wardrobes. No longer just a sports shoe, the classic all-white sneaker has made it into the fashion mainstream. Travelling through Italy more than 20 years ago, I was struck by the number of stylish women wearing white shoes under their sharp black Prada suits. Some wore lace-up oxfords, others wore white patent Tod’s loafers, but the vast majority were just sneakers. But it wasn’t about the style of footwear, it was all about the colour — white. At the time, I was rather bemused because in Australia, a white shoe is associated with the rather unfortunate “White Shoe Brigade” — those retired gentlemen (generally from the warmer climes of the Gold Coast) whose uniform of choice includes walk shorts, long socks and white shoes. But there in Rome, Florence and Milan, three of the most fashionable cities in the world, women were making an obvious fashion statement wearing all-white shoes under their everyday workwear office outfits. So what does one do when in Rome? Do as the Romans. So I bought a pair of “Tod’s-like” white patent loafers. (And, of course, the matching white patent tote bag.) Back home they became a staple of my wardrobe, as I worked them back with my sharp black Saba suits (the original Joe Saba styles), a variety of pants, skirts and dresses, and jeans. I’ve championed the look for years — swapping out the white patent loafers for white canvas Converse, Vans and Supergas, and a pair of lace-up leather Church’s brogues. For several years now, a younger fashion set have ditched their predecessors’ love of stilettos for more sensible footwear — mostly sneakers — a trend coined as “normcore”. Needless to say the fashion industry, which often takes its cues from the street, has in recent seasons featured more athletic-inspired and the very on-trend sports luxe looks on the runways. As a consequence the traditional sports shoe has transformed into more contemporary versions and is being paired with everything from couture to casual. 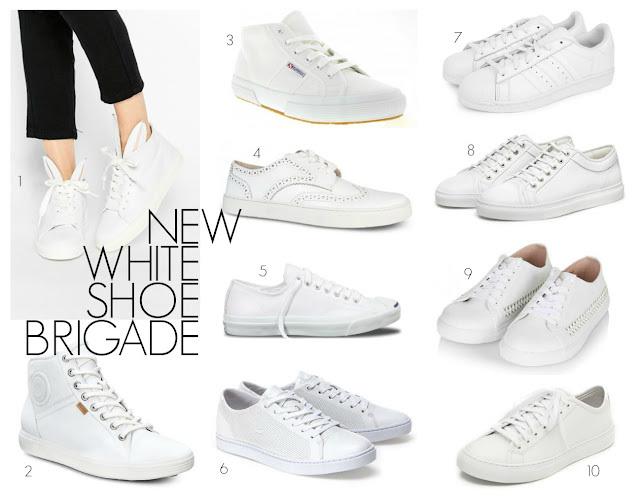 Meanwhile, back in Europe, the classic all-white sneaker is all the rage — again. Actually I don’t think it ever really went away. And just like denim jeans and the classic white shirt, the white sneaker is also ageless, classless and timeless. Just what every woman needs! Here is my selection of some of the best. Are you a fan of white sneakers? How do you wear yours? Wear them to the office? Do you have a preferred brand or style? Would love to hear from you.